When it came time to make a new character, I chose Minmatar, of the Sebastior bloodline, with a focus on fighting skills; soldier over special forces. This makes him a totally viable mission-runner (assuming no catastrophic mistakes in ship fitting) right out of the tutorial. Conventional Wisdom dictates that the Rifter is the best of the Minmatar fighting frigates. Indeed, it’s an outstanding ship; cheap, robust and rugged, and it was my ship of choice in a previous go-round with EVE. This time, I’ve decided to go a slightly different route. One of the series of tutorial missions rewarded me with a Breacher, which is the Minmatar missile frigate. I think I’ll stick with that at least until such time as it proves unworkable or I get it blown up; I’ve always liked playing with missiles in EVE, and my new character, who I’ll call ‘Gus,’ has the skills to use them right out of the gate. Admittedly, he’s better with Autocannons, but hey, I may as well experiment, and if this ship can last for even a week it’ll save me probably 300K ISK in the early game, when that miniscule amount of money can make a big difference. Plus, it looks cool; I love the look of the Minmatar ships in general, with their solar panels and asymmetric hulls. The Breacher fits this aesthetic better than the Rifter (although the Rifter is very sweet-looking as well.) This was one reason why I returned to my original choice of race after a sojurn with the Caldari in my last pass. Besides, who wants to play the most popular race? It occurs to me that I don’t remember whether a Salvager fits in a turret or launcher slot, or both. So The Breacher may only last as long as it takes to get salvaging up and running, really, at which point I’ll go pick me up a Rifter, adopting my traditional tactic with that ship of speed and short-range guns. At any rate, I’ve also resolved to soak up, as much as possible, the ambience of EVE (which I think is very rich and evocative,) and not to worry too much, at this point, about digging into out-of-game technical minutiae or reading the forums or anything like that. I just want to have a good time for the duration of the trial, and we’ll see what happens after that. Hey Ardwulf, great blog! 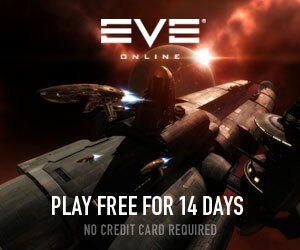 I have been tempted to dip into EVE as an additional MMO to my lifetime LOTRO subscription. Does EVE keep your old account information if you play sporadically? IE, will you lose your characters and advancement if you take a 2-6 month break now and then? EVE not only keeps your old characters after you cancel, but if you were training a skill it still trains. Many people will actually cancel accounts if they have a 30+ day train time on a skill in order to “let it burn” for free, Of course once it finishes then training stops, and you need to reactivate to be able to switch to a new one. Ardwulf — I’m based in Gulfonodi in Matari space right now (6 jumps from Rens), so if you need a mission running partner or fell like making a foray into lowsec (I found a sweet 2/10 plex in 0.3 space today) and I’m on in the evening, feel free to convo me. The toon I fly is “Boaz Netopalis.” Admittedly I spend more evening with the GF than online, but you never know. I’m also playing EQ2 and Vanguard, but for the next couple of weeks I can make the effort to be on EVE instead if that’d help you out. Thanks for the offer – I’m really just getting started at this point, with this character, and won’t have a need for a parter until moving up to level 2 missions – but then, you never know when ‘Worlds Collide’ will come up. You’re very close to me – I’m based in Rens at the moment, doing missions for the Brutor Tribe. I’ll bookmark you in-game and keep an eye out for you! This will be cool. Thanks for sharing your new adventures. Brutor’s good in Rens. I did a lot of missions for them there, and also in Frarn, but decided those systems were a little crowded for me, so I started working for the Republic Fleet instead. I’ve got enough status to move to a better agent in Gelfiven, but Gulfonodi’s just so “perfect” for mission running, and my social skills are high enough that the agent is effectively over 20 anyway. Anyway, I’ve got frigs and cruisers in the area, and I make a hauler run to Rens every so often to sell my loot, so I know the way anymore 😉 So if the WC mission does come up I don’t recall getting it from Brutor at level 1 though. I got WC4 a lot, though once I was in the level 4’s. Go figure. Probably just luck of the draw. Anyway, I should be on the next couple of evenings, so if you need anything hit me up.